National Academy of Strength and Power (NASP) for powerlifting. I love helping people achieve their goals. I teach clients proper technique and skills on all exercises, therefore minimizing the risk of injuries. My goal is improving my clients’ quality of life through education, motivation and designing personalized fitness programs. I stress the long-term health benefits of improving one’s strength, flexibility and cardiovascular fitness which leads to better appearance, positive outlook on life and enhanced self-esteem. 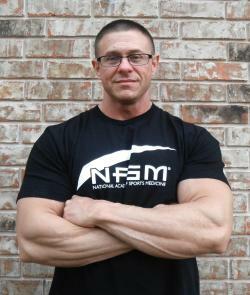 ​I have been training for fifteen years in bodybuilding, powerlifting and overall power and strength. After many years of trial and error not to mention injuries I wanted to figure out a better way to train, I was sick of making progress just to have a setback with injuries. So I became obsessed with learning biomechanics, kinesiology, human anatomy and proper stretching to name a few. I wanted to learn why my body does what it does. Now I have a greater understanding of how the body works, which led me to where I am today. I walk into the gym and see people doing the same bad form and technique I used to do and I understand why but it drives me crazy. I want to help people, to ensure they have a long healthy life in the gym without injuries. So I went back to school, I am certified through National Academy of Sports Medicine (NASM) as a Personal Trainer. I am also certified through National Academy of Strength and Power (NASP) for powerlifting coach. I am also certified in Nutrition for Peak Performance and continuing to go to school for Corrective Exercise and many other certifications. If you're willing to put the time and effort into maximizing your fitness results I can guide you along the way. Whether it’s online training with diet counseling or in person I will write a personalized program for you and only you.